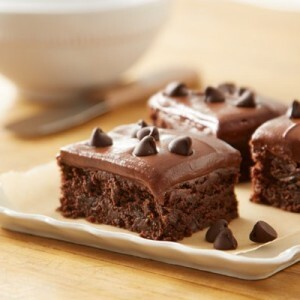 Everything Hershey for the ultimate chocolate brownies. Heat oven to 350°F. Grease 13x9x2-inch baking pan or two 8-inch square baking pans. 3. Bake 35 to 40 minutes for rectangular pan, 30 to 35 minutes for square pans or until brownies begin to pull away from sides of pan. Cool completely in pan on wire rack. Frost with ONE-BOWL BUTTERCREAM FROSTING. Garnish with chocolate chips, if desired. Cut into squares. beating to spreading consistency (additional milk may be needed). Stir in vanilla.